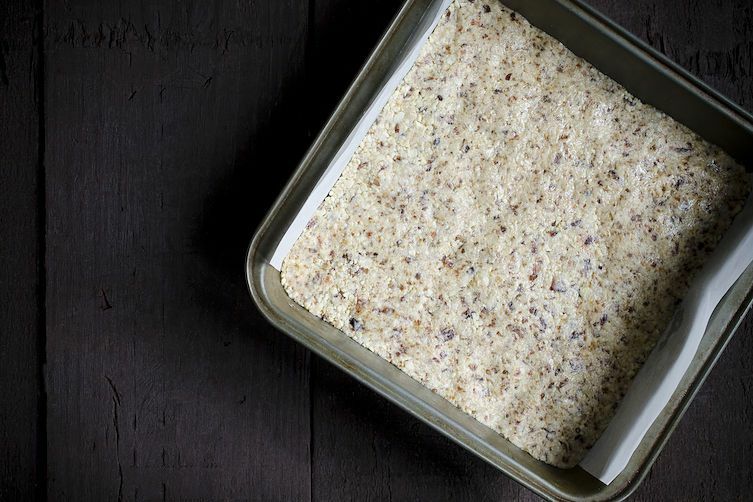 Today: Jennifer Farley of Savory Simple makes a homemade version of store-bought fruit and nut bars that are filling, flavorful, and just as sweet as you want them to be. When it comes to healthy snacks, I’m picky: They have to be filling and flavorful. 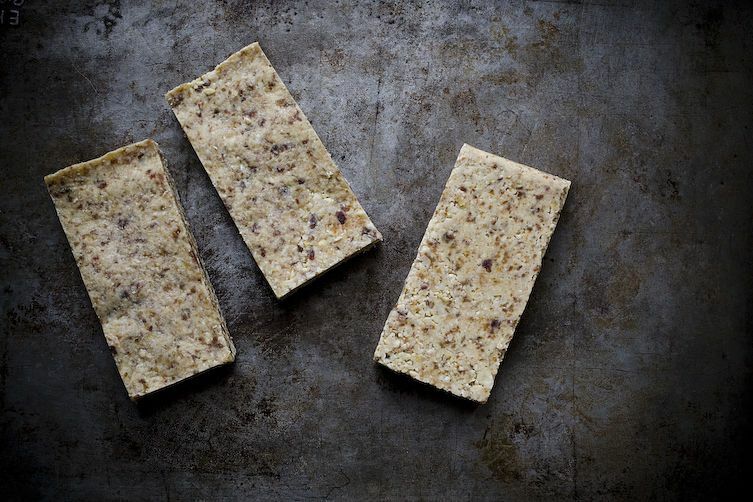 While I love the idea behind store-bought fruit and nut bars, they’re usually too sweet for me. But because the ingredient lists are so appealing -- most contain just nuts, dried fruit, and spices -- I figured this was an excellent recipe to recreate at home. 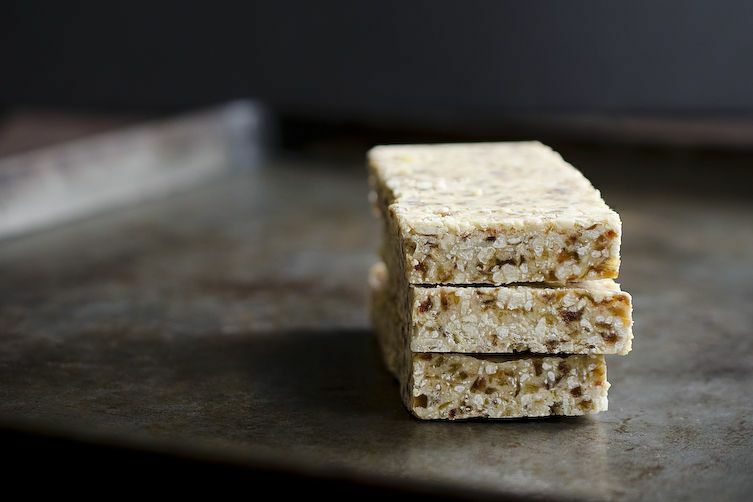 I’ve combined some of my favorite ingredients into a no-bake snack bar that is seriously addicting. 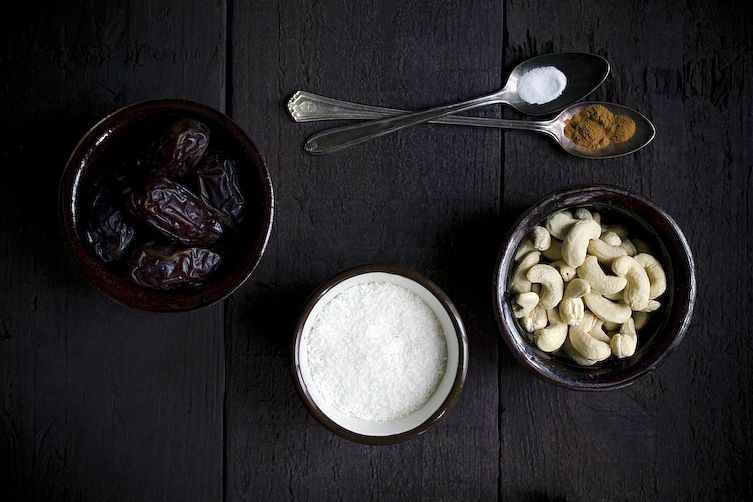 Cashews provide a delicate crunch, medjool dates add the right amount of sweetness, coconut oil is the binder, and coconut butter…well, coconut butter is my new favorite ingredient. I eat it straight from the jar with a spoon. (If you’ve never tried it, you’re seriously missing out.) Toasted coconut is the final key ingredient that gives these snacks their signature flavor. Make these bars now and thank me later. More: Before you get started, make a batch of homemade coconut butter. Preheat the oven to 350° F. Spread the coconut evenly across a baking sheet and toast in the oven for 3 minutes. Stir well, then cook for another 2 minutes, or until golden and fragrant. 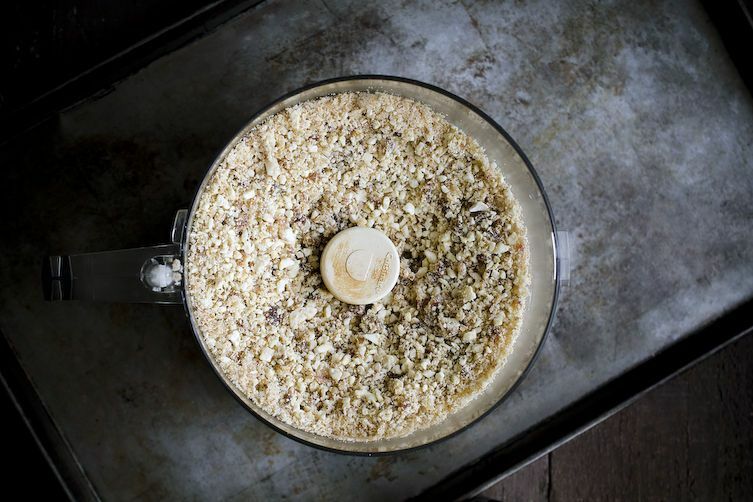 Set the toasted coconut aside and use the same baking sheet to toast the cashews for 5 minutes, or until fragrant. 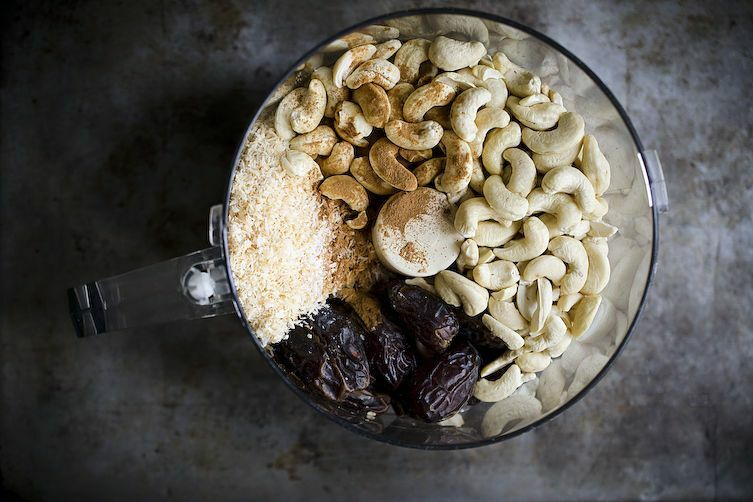 Combine coconut, cashews, dates, cinnamon, and salt in the bowl of a food processor. 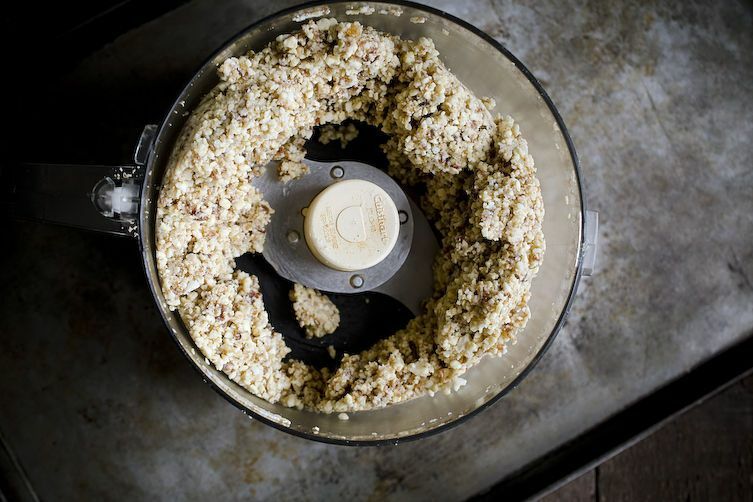 Add the coconut butter and 1/2 tablespoon coconut oil to the food processor and continue pulsing until the mixture begins to clump. If it seems dry, add another 1/2 tablespoon of coconut oil. Line an 8 x 8-inch brownie pan with parchment paper, allowing two sides to hang over the side of the pan. Dab a bit of coconut oil on the brownie pan to help the parchment stick. Press the mixture into the pan, using a piece of plastic wrap to help flatten everything evenly. Freeze the mixture for 15 to 20 minutes, then slice the bars into 8 pieces. Wrap the bars individually and store them in the refrigerator or freezer. I don't have a regular food processor, but I do have a Vita-Mix. Any thoughts on how/if that'll work instead ? I'm just starting to make my own healthy & nutritious foods (instead of store bought stuff) & I really want to make these bars for snacks (instead of eating cookies & other junk food!). I spoke w/one of the sales girls on the floor @ TJ Maxx about my plans & she thought it was a great idea & said that SHE ALSO has been thinking about doing it at her home too!! I think more & more people are getting to the point that, not only do they want to know exactly WHAT goes into the snacks that they're buying, but, also they feel, if they can find out what's IN these healthier versions of the "store bought stuff", that maybe THEY can get creative & make their own, to their taste, kind of snacks, etc. It seems to be sweeping the nation, this need to fix our own selves....to get healthier & stay healthy, & the best way to do that is to actually know what we eat & "make it ourselves"!! Good nutrition = good health...& who isn't all for THAT?? Thanx SO much for this site & the great recipes!! Can anyone tell me if these are raw or roasted almonds?? What kind of finished texture do you end up with, Cruncy vs Chewy? They're soft and dense like a Larabar. 160 calories, 9.5 g fat (3.8 saturated), 18.4 g sodium, 151.7 g potassium, 18.8 g carbs, 2.6 g fiber, 12.9 g sugar, 3.1 g protein. they are calorie dense but in my opinion, the are, more importantly, nutrient dense without additives or processing. the saturated fat from the coconut oil is not to be stressed, the low sodium without loss of taste is exciting and the sugar is all natural so i'm super excited!! Wow, thank you Emily. I cut mine bigger, 12 or so, about the size of a Larabar. I'm a piggie! But bars like these, along with a kale smoothie for breakfast, totally get me through the day. In some of the photos, you can see "Cuisinart" on the center part of the blade insert. It's a good old fashioned Cuisinart! In fact, this one used to belong to my mother. Have you tried this recipe using seeds (sunflower or pumpkin) instead of nuts? I made this earlier today and while it doesn't look as neat as yours, it's incredibly delicious and satisfying. Using what I had at home, I did a mixture of almonds and cashews and a lot of dates and the toasted coconut which I love. I did a combination of coconut butter and coconut oil for moisture. It's open for all sorts of improvisations. 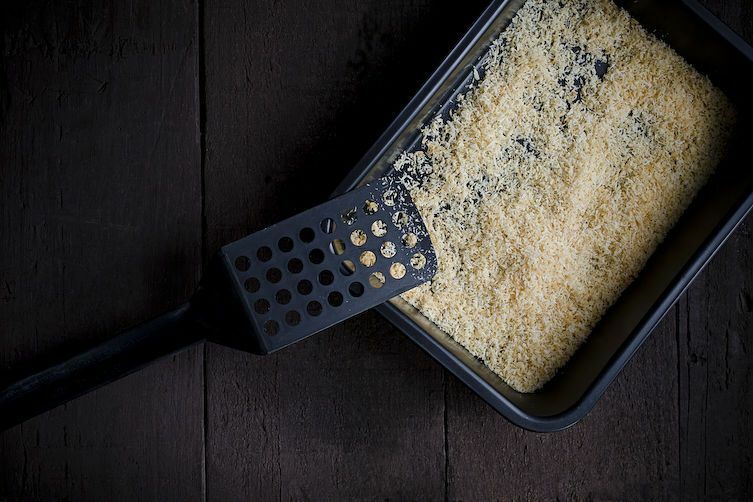 What about a substitution for the shredded coconut? I am not a big fan of it's taste or texture but I love the idea of making these as a quick and healthy snack. Funny you say that because I'm not a fan of the texture, either. But it gets so pureed in the food processor that the texture vanishes. You can omit the flakes but this will still have a coconut flavor because of the oil and butter. As I mentioned below, you can experiment with replacing these products with nut butter. Great, I'll play with it. Thanks Jennifer! Another thought I had as soon as I hit reply: try swapping the toasted coconut for things like dried fruit or mini chocolate chips. A whole different direction. Oh, I really like both those ideas (especially the chocolate, haha). That would go well with the nut butter substitution and the cinnamon. This is going to be fun! These look amazing! Can I sub another nut for cashews and regular butter for the coconut butter? Hi Rachel! 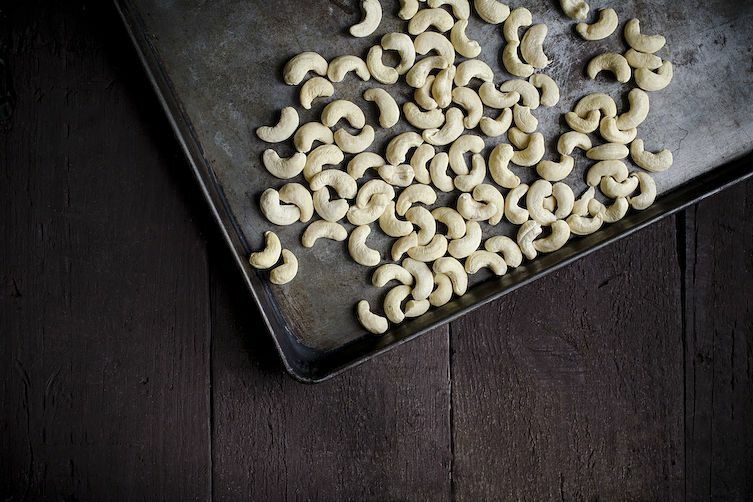 You can sub any nut in this recipe for the cashews. As for the coconut butter/butter substitution, it will *probably* work but coconut butter is much firmer than butter. My concern is that butter might create a greasy texture unless you eat the bars frozen. You could try starting with half the amount of butter & then adding a bit more if the mix isn't coming together. Another option is to omit coconut butter and increase the coconut oil slightly until the mix comes together. I would think a nut butter would work best as a substitute for coconut butter, though butter would do fine as a coconut oil substitute. Nut butter is an excellent suggestion! Still less firm than the coconut butter so I'd still recommend starting with less to make sure the bars are solid. I love, love Sara's granola bars Merrill posted a few years ago. Make them. A. Lot. Excited to try this one.